The legislature’s Finance, Revenue and Bonding Committee narrowly approved a measure Thursday that could establish electronic tolling on Connecticut’s highways. But despite the committee’s vote of approval, advocates conceded the bill’s fate remains very uncertain. Democrats hold a slim 26-25 edge on the finance committee, which narrowly passed the measure by the same, partisan margin. The bill would require the Department of Transportation to study how to establish tolling on Interstates 84, 91 and 95, and on the Merritt and Wilbur Cross parkways. 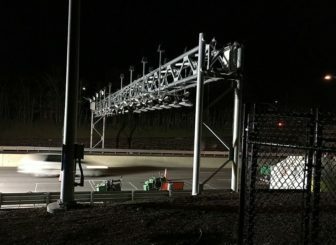 The department also would assess where toll gantries should be located, how much revenue would be raised from the system, and what types of discounts might be offered to Connecticut residents. The measure also would allow the legislature 30 days to act upon the report after receiving it during the 2019 General Assembly session. But if the House and Senate did not reject the DOT’s plan, the restoration of tolling would be deemed approved. Nonpartisan analysts this could raise $600 million to $800 million per year. The DOT has said it probably could not fully implement tolls before 2021. Advocates also argued tolls are the best way to capture revenue from out-of-state motorists. Transportation officials estimate about 30 percent of the revenue would come from outside Connecticut. “Every time you see an out-of-state car go by you, throw a buck out the window, because that’s what your doing, subsidizing those cars,” said Sen. Carlo Leone, D-Stamford. Sen. Stephen T. Cassano, D-Manchester, said, “It is a free ride for too many people” to cross through Connecticut while visiting various points in New England. Rep. Jason Rojas, D-East Hartford, the House chair of the finance committee, noted that the DOT commissioner does not have to recommend tolls, and the legislature still would have an opportunity to block any plan. Opposition to tolls remains strong in the full House and Senate, and some legislators say colleagues on the fence could be reluctant to back tolls in a state election year. Opponents on the finance committee said drawing $600 million to $800 million largely from Connecticut residents, who already pay high taxes, would damage the economy. Sen. Toni Boucher, R-Wilton, called it “a huge disincentive” for individuals and businesses to come to Connecticut. “This is opening up a huge spigot of new revenue, primarily at the expense of Connecticut residents,” said Sen. L. Scott Frantz of Greenwich, the committee’s Senate GOP chair. Rep. Chris Davis of Ellington, ranking GOP representative on the finance committee, who also opposed the bill, said, “We would be abdicating the responsibility of the legislature” by empowering the DOT to establish tolls. The Transportation Committee passed the tolls bill by a 20-16 margin on March 22. The measure now heads to the House of Representatives.